I had some blue items to post in mind, but this was my top pick to feature this week. Subsequently, the photos turned out telling a story on their own, so I figured it was perfect for Mosaic Monday as well. Have a wonderful Monday and enjoy the floppies tales. My daughter and I were running around the house and she wanted to put on her floppies. 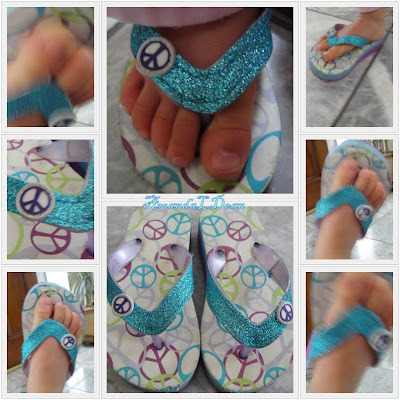 The sequins and peace sign have always attracted her and her mom's "magical tale" has stuck with her. Since I had my camera ready, I thought I would capture the floppies in action to share the "magical tale" we had going between us. Even though my floppies model was trying very hard to be co-operative, she couldn't hold her feet still long enough for my camera. We tried shooting sitting down, and even laying down, and these were the best shots we were able to get before my floppies model became weary. Pretty flip flops. How old is your model? aww...magical floppies..love it!! I love taking pics of my children's sweet feet! That's a wonderful story for super model. Love the tale of the magical floppies! Great mosaic! Magical floppies are awesome and they look really cute on her feet. Have a great day! Your model is like me; I don't care for shoes, either. Happy Blue Monday! Cute Magical Floppies to keep little feet safe from ouchies! Oh, those are so cute. I love the little colored peace signs. They look so comfy! I'm looking forward to flip-flop season again! The shoes are absolutely adorable. What a fantastic idea to get your daughter to wear shoes outside.